Deforestation Increases Floods. – architectkidd co. ltd.
March 31, 2012: The question of how much impact that deforestation has on flooding has been debated in environmental research. Analyzing something as large and complex as the ecological system presents challenges in isolating the causes and effects. This has led some people to believe that quantitative measurements on flooding and deforestation are too difficult to prove. Nonetheless, recent findings have provided correlations between forest loss and increase in flooding. One significant research, titled “Global evidence that deforestation amplifies flood risk and severity in the developing world”, considered 10 years of data from 56 countries. Based on data on flood occurrences, duration and loss of forests, researchers were able to mathematically model and demonstrate the effects of deforestation. The study concluded that a decrease in natural forest area of 10% resulted in increase of flood frequency from 4% to 28%. In addition, the same 10% decrease in forests in the surveyed countries resulted in a 4 to 8% increase in total flood duration. The full paper of this research can be found here. These findings (first published in 2007 in the journal Global Change Biology and conducted by Australian, Singapore and UK universities) are controversial within the scientific community. But even though some have questioned the researchers’ methodology (see comment here), there is no doubt in the scientific community that destructive and man-made changes to natural land, urbanization and population growth are key factors that increase flooding. In addition to these findings, Architectkidd have also been collecting information relating to what has been happening in Thailand and the province of Nakhon Ratchasima. 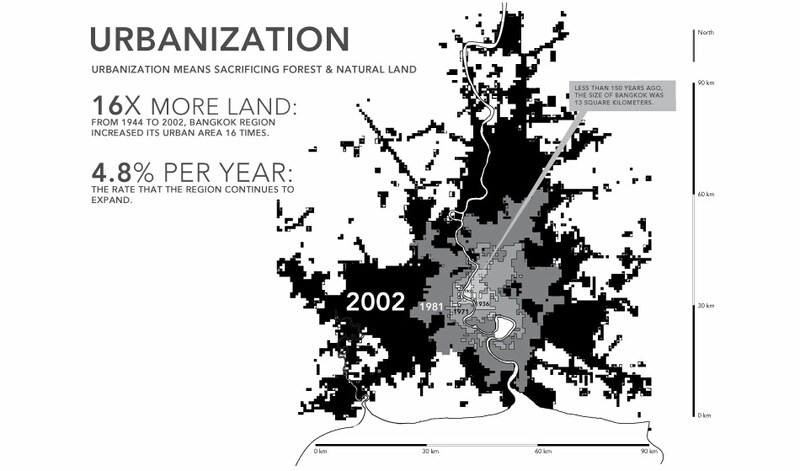 It became clear that we needed to provide more ways to show the relationships between deforestation, population growth and urbanization in Thailand. Based on the data that we collected, we designed a set of “infographics” in order to communicate to the public as well as to support our development of the ASA Water Cities project. 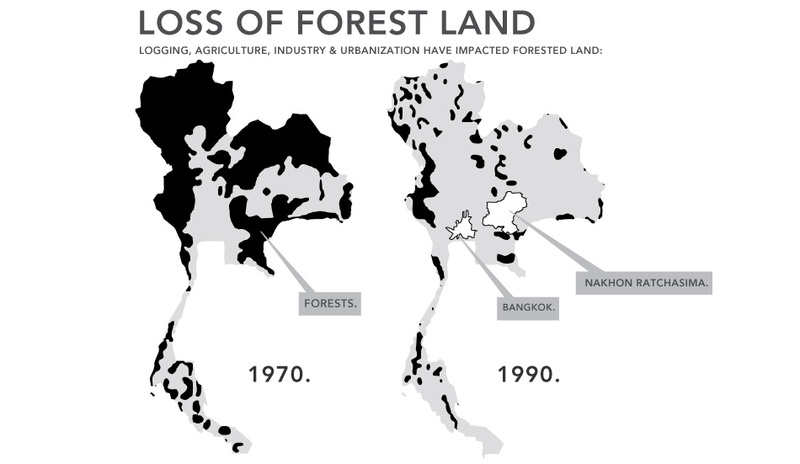 FORESTS vs. TIME: The above infographic shows dramatic forest loss in Thailand in a 20-year period (1970-1990). The data is adapted from Geographie universelle, Asie du Sud-Est, Hachette (1995). FORESTS vs. PEOPLE: This infographic considers the relationship between the increasing population of Thailand and loss of forests. It makes us wonder whether this decline will continue in the future. Population figures from various sources including United Nations. 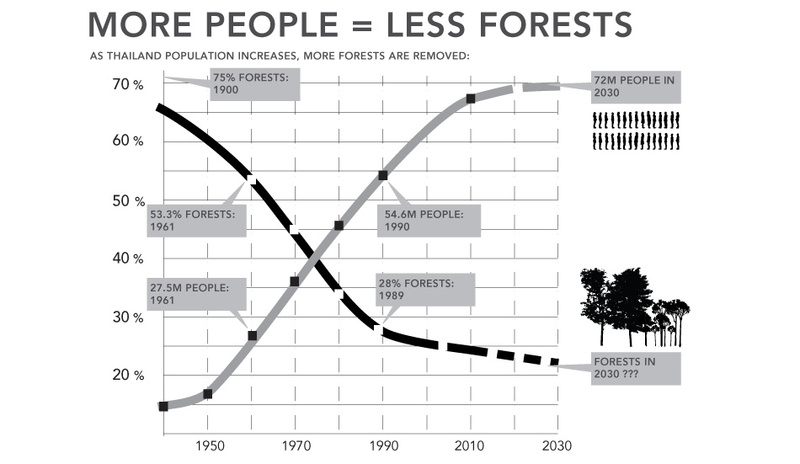 URBANIZATION consumes FORESTS: In the past, forest loss was caused by logging and agriculture. Today, urbanization and industrialization are key factors. As cities and industrial areas expand, they consume land that is occupied by trees and natural vegetation. Looking at Bangkok region as an example, the city increased its urbanized area 16 times, from 580 hectares in 1850 to 133,515 hectares in 2002. Sources: World Bank, Lincoln Institute of Land Policy (2011). 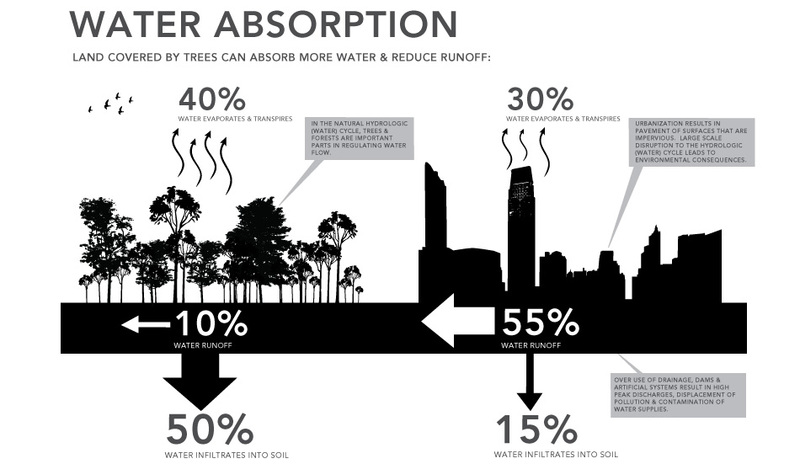 FORESTS absorb WATER: Yet forests can be beneficial for cities and urban areas. Land covered by trees absorb more surface water compared to paved and open areas. Data from US EPA (Environmental Protection Agency, 1993). 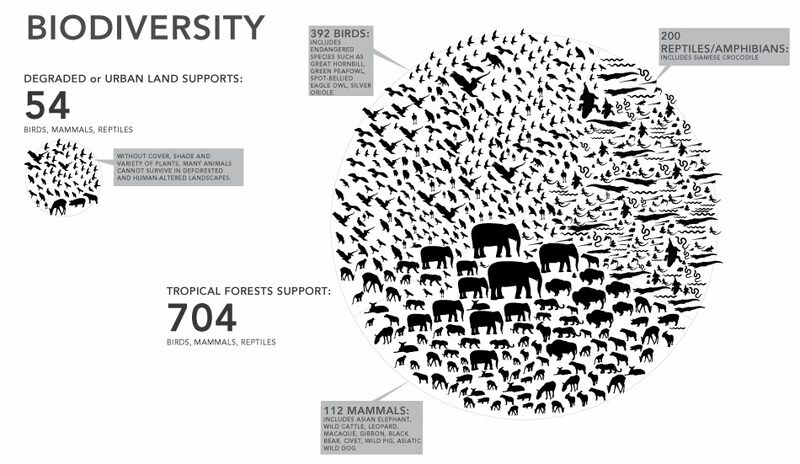 FORESTS and BIODIVERSITY: Trees not only support other vegetation and plants but also animal habitat. When the Thai government submitted the proposal to nominate the Khao Yai Park (Dong Phayayen – Khao Yai Forest Complex) to the UNESCO World Heritage committee, it conducted a survey of the number of animals in the region. The results are compared to surveys on degraded or open areas.